This file makes that Fedora and CentOS appliances are created with the format qcow2 (RedHat and Scientific Linux appliances would still use raw format), and that the appliances are automatically copied to the remote KVM host. By default, BoxGrinder creates virtual hard drives as IDE drives. The option bus: virtio makes the appliance use the virtio driver which is faster. 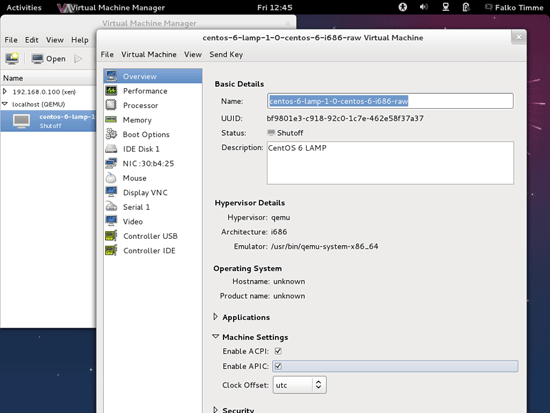 The default hypervisor is Qemu; by using domain_type: kvm we use KVM which is faster. ... if you are still in the /usr/local/appliances directory. 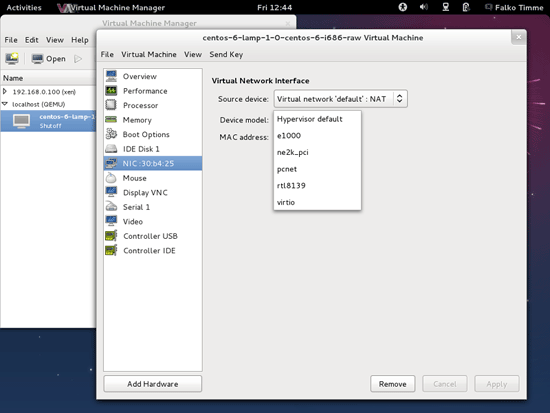 BoxGrinder uses some strange default settings, therefore you should check a few things in the Virtual Machine Manager before you start an appliance for the first time. BoxGrinder creates appliances with the U.S. keyboard layout by default. If you use a different keyboard, please open /etc/sysconfig/keyboard in the appliance and adjust it to your needs.